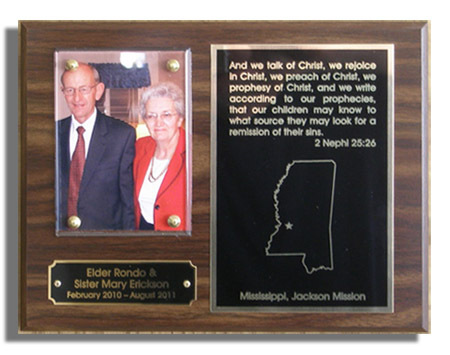 A great way to recognize the service of the missionary, soldier, or volunteer in your church or group. These 9" x 7" plaques include an 3" x 4-1/4" acrylic photo cover plate, Engraved brass nameplate and engraved metal quotation and service area plate. Get the look of hardwood for less! Our standard plaques are made of a of a walnut finished hardboard for the look and feel of solid wood without the expense. Oak, mahogany, and black finishes are also available. For those who want the quality of actual solid hardwood; solid walnut, oak, cherry and for the ecologically minded new bamboo plaques can be provided. Plaques include a keyhole slot for wall or display case hanging. Hardware can be provided for those who wish to mount the photo themselves, or a photo may be brought or sent in for free mounting by us. For a small convenience fee photos may uploaded to us for printing mounting and plaques can be shipped direct to you. 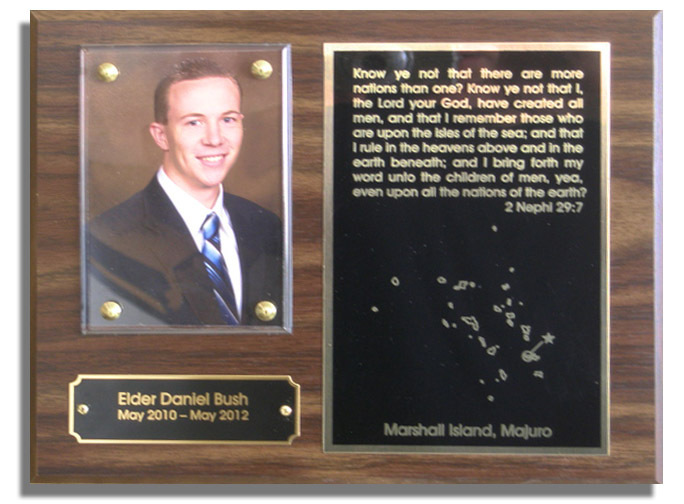 Plaques may be picked up at our main office upon completion or they can be mailed direct to you. Production time is approximately 3 to 5 working days from the time the order is placed. A 9" x 7" walnut finish plaque with acrylic photo cover plate, Engraved brass nameplate and engraved metal quotation and service area plate. The plaque is slotted on the back for hanging. Please fill out an plaque order form for each plaque ordered. An 9" x 7" oak, mahogany or black finished plaque with acrylic photo cover plate, Engraved brass nameplate and engraved metal quotation and service area plate. The plaque is slotted on the back for hanging. Please fill out an plaque order form for each plaque ordered. A 9" x 7" solid walnut, oak, cherry or bamboo plaque with acrylic photo cover plate, Engraved brass nameplate and engraved metal quotation and service area plate. The plaque is slotted on the back for hanging. Please fill out an plaque order form for each plaque ordered. Upload a photo for printing and mounting.